I’m early this week and I’ve posted my Portuguese Stem stitch sample on my blog. I rather like this stitch it has great texture. 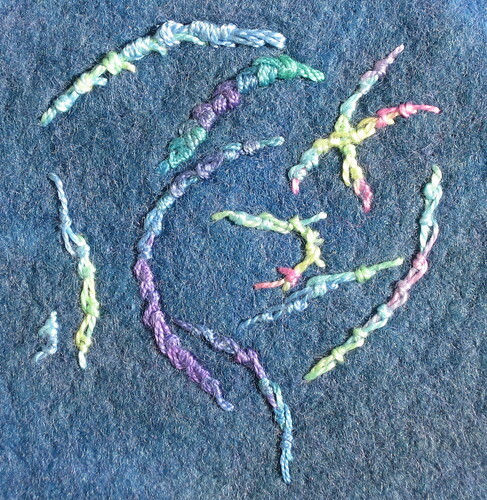 A very nice and easy stitch to do and will be added to my ‘often used’ selection. I really like this stitch to do and the lovely worked effect you get. I tried experimenting with the stich but it did not seem to lend itself to much structural alteration without turning into knitting! On anotther matter good luck with the new blog arrangements. As has been said earlier readers will find you and you must make a structure or frame work for your sharing work which suits you best. One thing that is better is that having clicked on to another link while writting this comment I am delighted to find my text still here in progress so to speak …..
After a long hiatus, I’m back to taking part in tast. Dump as I am I posted to the old blog first. So here is my feeble attempt at portugese stem stitch again. I like these stitches with the raised texture. My focus is on art quilts and I will be incorporating some of the stitches. I am up to date! also updated my blogroll with your new address. Like Vivian above i’m up to date! Hi Sharon, I’ve completed my sample and it’s blogged here – Blogged here – https://sharonb.wordpress.com/take-a-stitch-tuesday-challenge/ What a great stitch this one is. I finally gave up on getting a good photo of my Portuguese Stem Stitch and posted what I had on my blog.